Growing a private practice is a different endeavor than it was 20 years ago. Therapists who’ve embraced technology and those still on the fence discuss the benefits and risks of attracting clients in cyberspace. Julie Hanks, LCSW, has a self-professed love of technology—and it shows. Hanks is owner and clinical director of Wasatch Family Therapy in Cottonwood Heights, UT. The practice has its own website, Facebook page, Twitter account, and YouTube channel. Hanks and her staff send an e-newsletter each month, use Google’s calendar function for client scheduling, and send bills through e-mail. While many social workers and other mental health professionals in private practice are not as tech savvy as Hanks, an increasing number of them are using technology—particularly social media—to market their services. This has started a debate among social workers about whether embracing technology is simply a necessary business move or a trend that puts the profession’s ethics in jeopardy. And the speed of technological change is leaving many social workers to fend for themselves as they try to navigate the digital world. A visit to Wasatch Family Therapy’s website illustrates just how many technological tools are available to private practitioners who want to market themselves and educate the public about mental health issues. A blog on the site covers topics ranging from relationships to bulimia to borderline personality disorder. There is a page devoted to recommended books and a calendar where people can follow Hanks’ appearances on local radio and television stations. There are links to the practice’s Facebook page and Twitter feed. And they have found her. From its small beginnings, Wasatch Family Therapy has grown into a practice with several therapists. Hanks and others in her practice have attracted coverage from various national media outlets, including E! Online, MSN, AOL Health, and Women’s Day. Other social workers are hoping to attract the same traffic and attention through their own forays into technology. When Carly Goldberg, MSW, LCSW, a doctoral candidate at the University of Pennsylvania School of Social Policy and Practice, decided to establish a feminist counseling and social action organization, she knew technology would be critical in helping her get her message out. The result is the Women’s Collaborative Circle, of which she is founder and executive director, which maintains a website featuring information on Goldberg’s services, a blog on women’s issues, a listing of community resources, and links to Facebook and Twitter. Goldberg, who is based in Ardmore, PA, acknowledges that it was a challenge to embrace technology in the beginning when it seemed she was the only one reading her blog posts. But eventually, business picked up. Another way private practitioners are using technology is to make their presence known on websites that potential clients are likely to visit. Denise Duval, PhD, LCSW, a therapist at Child Therapy in Chicago, who serves children and young adults, posts comments on sites such as ChicagoTribune.com and Mamapedia.com. Each time she posts, Duval includes a link to her website. She says such efforts have helped her connect with both parents and other professionals in her field. Technology has helped some counselors bridge geographic gaps with clients. Duval continues to work with clients who have moved away via phone or Google Chat. And Beth Kozan, MEd, LPC, of Phoenix, uses instant messaging through Facebook to counsel some of her clients who are too far away or who don’t feel comfortable speaking face to face. She also has the ability to do sessions via Skype. For some mental health professionals, proficiency with technology has given them a new source of business: other therapists. Peter Hannah, MA, LMHC, a psychotherapist, worked in the technology sector until returning to school in 2000 to become a therapist. Now, in addition to having a private practice in Seattle, Hannah runs YourGoogleGuy.com, where he helps therapists design their websites so they are easily found by Internet search engines such as Google. Search engine optimization is especially important to therapists because many people are still uncomfortable seeking information about counseling services through social sites such as Facebook, Hannah says. That difference is what makes some social workers nervous when they hear about colleagues jumping into the technological fray. 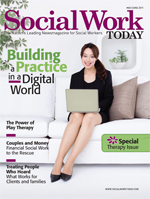 Social work’s special protections for client privacy and confidentiality can be easily compromised when technology gives the public access to information about therapists and their services, says Laura W. Groshong, LICSW, a Seattle-based therapist and director of government relations for the Clinical Social Work Association. Especially problematic, Groshong says, is the use of social media such as Facebook and Twitter. That’s because Facebook posts and tweets create an appearance of social relationships between therapists and current/potential clients that should not exist. Private practitioners also have to ensure that any client information they store on computers or online is safe from hackers. Grodzki says it’s essential to back up files, encrypt e-mails, refrain from identifying individual clients, and ensure compliance with HIPAA, among other precautions. Part of the problem is that technology is changing so quickly, making it difficult for professional associations to provide guidelines about how to ethically respond to specific technology issues, says Keely Kolmes, PsyD, a psychologist in San Francisco. But that doesn’t mean the existing rules don’t apply in the technological realm, she says. The discussion about technology and ethics is not limited to seasoned professionals. At Lee University in Cleveland, TN, students working in the graduate counseling clinic use a program called TherapyNotes to take notes online. Using TherapyNotes not only gives students the experience of working with technology in their practice, but it also forces them to consider and navigate the ethical implications of such technology, says Trevor Milliron, PhD, an associate professor of psychology and director of Lee University’s graduate programs in counseling. • Formulate a clear reason why you want to use technology. How do you want to come across? Who is your audience? Is technology the best way to reach them? Articulating a purpose before you start will help prevent your technology efforts from veering off track into unethical territory. • Articulate the messages you want to send via technology so people can clearly understand your background, approach, and services. Avoid jargon. • Seek guidance from professional organizations such as the National Association of Social Workers and the Clinical Social Work Association. • Have a communications policy that tells clients how you use technology and what types of technological communication you will and will not accept from clients. An example of such a policy can be found on Kolmes’ website (www.drkkolmes.com). • If you have a presence online, make sure any phone numbers or e-mail addresses listed are professional ones, not private ones. Keep personal information off your practice’s Facebook page and out of your tweets. Consider whether you should even have a personal Facebook page. • Keep all blog posts, Facebook posts, tweets, and similar communications topic focused, not client focused. • Think before you post anything. Realize the potential for many people to see what you write or say. • Even if you are not planning to use technology in your practice, it is good to consider best practices because technology’s impact on private social work practice will only continue to grow, Duval says. Groshong believes the debate over technology highlights the need for social workers to better address the generational rifts in the profession. She experienced this firsthand when she did a training last year about clinicians using social media. Older providers understood the concerns she was expressing about social media, but many younger providers seemed offended that she would question something that was such an integral part of their lives. — Christina Reardon, MSW, LSW, is a freelance writer based in Harrisburg, PA, and contributing editor at Social Work Today. Diane Broadnax, LICSW, of Mt. Airy, MD, has witnessed how technology has changed the way people communicate—and she doesn’t like what she sees. There are friends who would rather text than call if they have to say something they don’t feel comfortable expressing. And her children and her husband seem to want to interact more with machines than with each other. So in November 2010, Broadnax decided to fight back. She arrived home one day and told her family that they would embark on a five-day “technology fast.” The family was allowed to use computers and other devices only for work but not for entertainment or personal diversion. Despite some complaining, griping, and awkward moments, the family persevered through its technology exile. By the fifth day, Broadnax came home to find her family playing a board game. The laughter, joking, and interaction she so desperately sought was finally apparent. But the story doesn’t end there. Broadnax kept a journal during the fast and as word about her experiment spread, it began to attract media attention. She was interviewed by the Wall Street Journal and two television stations and quoted in another local publication. Although the technology fast may have started as an amusing family exercise, Broadnax believes its results have serious implications for social workers: They should be aware of how much technology affects clients’ lives, including their relationships and communications skills, she says. And social workers also need to realize how they are being shaped by the alluring power of technology.